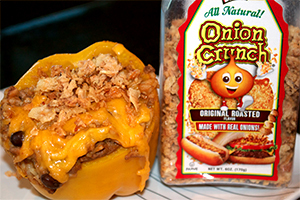 Use Onion Crunch® as a substitute in many of your favorite recipes that call for fresh or fried onions. Use it as a condiment and add it to your favorite soups, dips and casseroles. 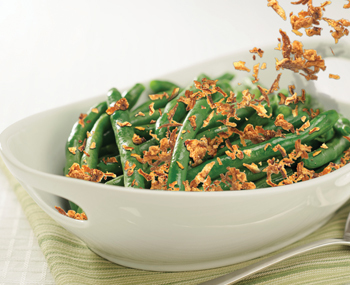 Combine green beans, soup, milk, pepper and 1/2 cup of Onion Crunch®. Gently stir together. Spread mixture in a 1 1/2 to 2 quart ovenproof casserole dish. Bake at 350°F for 25 minutes or until hot and bubbly. 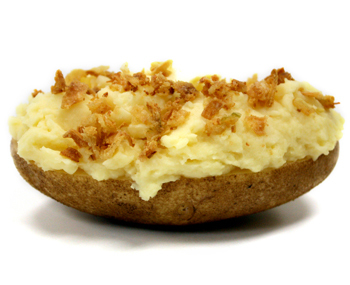 Top with a layer of Onion Crunch®. Bake 5 minutes more. This easy to make green bean casserole serves six. *May substitute 18 ounces frozen cut green beans, thawed and drained. Melt 4 tablespoons butter in a large skillet over medium heat. Add the shallots and saute until translucent, about 3 minutes. Add the mushrooms, thyme and sage and saute until most of the liquid has evaporated, about 10 minutes. Stir in the flour and cook 5 more minutes. Next add the sherry and stir until thickened. Add the cream and simmer an additional 5 minutes. Set sauce aside. Melt the remaining butter in a large skillet over high heat. Add the beans, toss to coat with the butter and saute until bright green, about 7 minutes. They’ll still be crispy. Season with salt and pepper and place on a platter. Bring the sauce to a simmer and spoon over the beans. 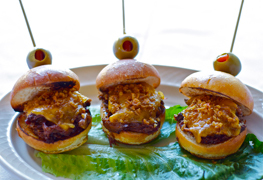 Top with Onion Crunch®. 1. 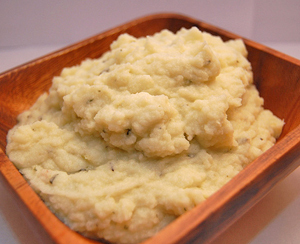 Preheat oven to 450 F. Arrange potatoes, overlapping slightly, in a 13 x 9" baking dish. Brush margarine over potatoes. Sprinkle potatoes with garlic, pepper, thyme, and salt. 2. 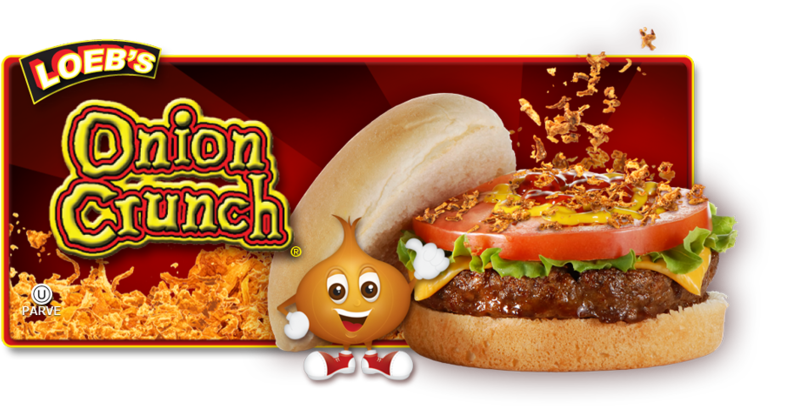 Shake Onion Crunch® over potatoes in a single layer. 3. Bake casserole until potatoes are cooked through about 30-35 minutes. Serve immediately. Serves four. 1. Preheat oven to 350F. Lightly grease a casserole dish and set aside until ready to assemble. 2. In a medium skillet, melt butter over medium heat. Stir in flour and whisk constantly for 2 minutes. 4. Add salt, nutmeg, 1 tsp. thyme, then whisk in cheddar cheese. 5. To assemble, layer half of the potatoes, ham, and cheese sauce. Repeat. 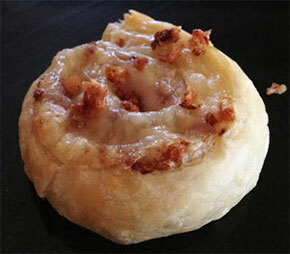 Mix together shredded Gruyere, Onion Crunch, and remaining 1 tsp. thyme. Sprinkle mixture over casserole. Bake casserole covered with aluminum foil for 45 minutes. 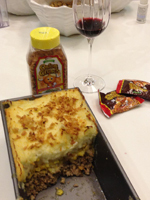 Remove foil and bake an additional 15 minutes until cheese is bubbling and Onion Crunch is browned. 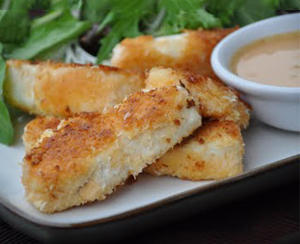 * If cheese is added when mixture is too hot, the milk solids separate resulting in an undesirable grainy texture. 2. Heat a large nonstick skillet coated with cooking spray over medium-high heat. 3. Add green bell pepper strips, and sauté 6 minutes or until tender. 4. Remove casings from sausage. Add sausage to pan, and cook 5 minutes or until lightly browned, stirring to crumble. 5. 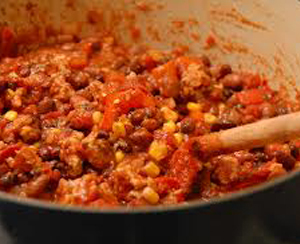 Add crushed red pepper and diced tomatoes, and cook 5 minutes or until mixture thickens. 6. Spread sausage mixture evenly over cut sides of bread, and sprinkle evenly with cheese & Onion Crunch®. 7. Place bread halves on a baking sheet. 8. Bake at 450° for 5 minutes or until cheese melts. Cut each pizza in half and enjoy! 1. Start out with (1) 24 ounce dough ball, spread out in pan. 2. 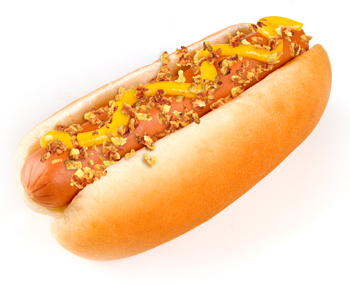 Sprinkle with Onion Crunch® and crumbled sausage. 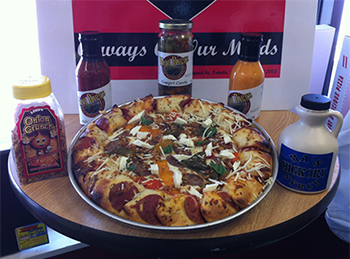 with Onion Crunch® in the sauce as well as fresh basil and garlic. 4. Top 14 ounces of mozzarella provolone mix. 5. Press sausage into crust, pressing out sides to form a one inch border. 6. 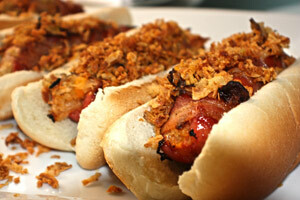 Add half pound of fresh home made sausage with Onion Crunch® pressed into sausage. 7. Add 4 ounces of fresh mozzarella and bake for 9 min. at 550 degrees F.
8. When pizza comes out dust with garlic Parmesan butter and fresh asiago cheese. 9. 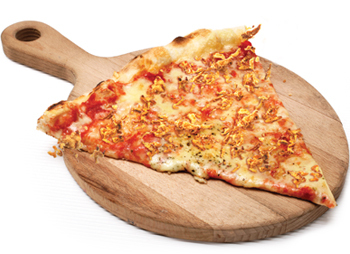 Sprinkle Onion Crunch® on top cut and serve. 2. Place the pizza crust on a baking sheet. 3. Combine the sauce and tomatoes. 4. Spread sauce mixture over pizza crust. 5. 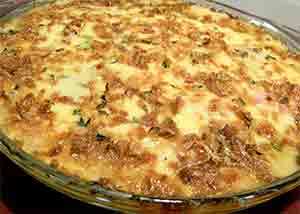 Top with Onion Crunch® and cheese. 6. Bake for 11 minutes or until crust is golden brown. 7. Sprinkle with basil and enjoy!